Do you love Christmas decorations? Then don't leave any area undecorated. 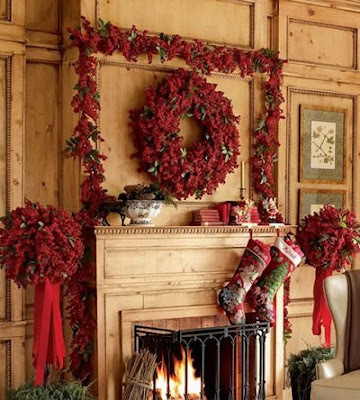 Get ideas for Christmas decorating every area of your home, inside and out! If you're like most people, you don't have much time left at the end of a busy day to do anything extra. But at this time of year, you want to do something to make your home look festive and special and create the wonderful Christmas holiday atmosphere. You'll find some ideas here for quick and simple ways to add a festive look to your home without spending a lot of time or money. And you'll have time left over to really enjoy Christmas! Bows look festive and the ribbons you choose should tie together with the rest of your decorating. Choose ribbons in colors and patterns that coordinate with your decorating scheme. Tie generous ribbons to chair backs, candlesticks, picks in plants, wreaths, garlands, basket handles, drapery tie-backs, stair railings, and doorknobs. You don't have to stick with red and green. Choose plaids or florals that tie in. If you can't find anything that looks quite right, then choose metallic silver, gold, green, or red. Choose a ribbon that you can untie and re-tie each year. This will save money in the long run, and you'll end up with a good collection. When the holidays are over, untie the ribbons and press them lightly. The bows won't get crushed and the ribbons will be ready when you want to take them out the next year. Arrange lots of candles on the dining table and dine by candlelight, even if you're just having leftovers. Every meal will feel special. Burn a fire in the fireplace each evening and encourage family members to gather around and read, do homework, write Christmas cards, or snooze. Arrange pillar candles in your bathroom, on the sink or around the tub. Take time to soak and enjoy! If you have little children in your home, you should be very careful with candles around the house. Always have an adult in the room. Put a wreath or swag on every door you have. Of course, start with the front door to welcome guests. Go on to the back door, inside and out. Remember over the mantle, and in all your front windows. Don't forget bedroom doors, inside and out. 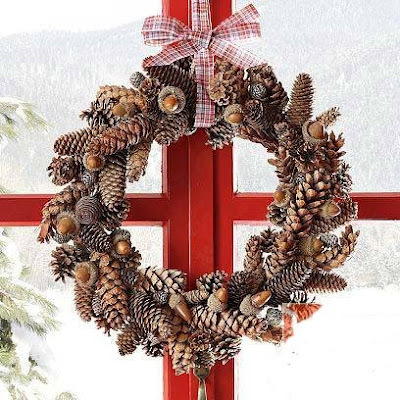 Use real pine, holly, or grapevine, decorated with bows, berries, fruit, pinecones, raffia, ornaments, birds, photos, or candy. Look through your cupboards and get out any dishes that look festive. Discount stores often carry seconds of name brand porcelain, as well as fun designs that are not so common. Start a set of holiday dishes with dinner plates that coordinate with your everyday dishes. Add new pieces each year, like salad plates and mugs. Buy 1 or 2 place settings each year. Before long, you'll be able to serve a feast. If you're adventuresome, choose a different pattern and one place setting each year. Arrange the different dishes around the table and get lots of comments and rekindle memories. When they're not in use, the dishes can be displayed around the room. To keep wreaths year after year, buy artificial wreaths that will last. Remember, you'll need room to store them! When Christmas is over and it's time to get back to basics, you might find these organization and storage tips helpful. Get your ornaments, wreaths, garlands, and other decorations organized for next year. Other common Christmas decorations include plants such as mistletoe, holly, and poinsettias. Although church and state have been separated, many cities still sponsor secular decorations in their downtown areas such as banners and Christmas trees.